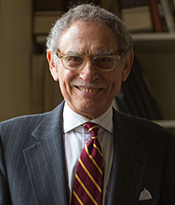 Hadley Arkes is a Senior Fellow of the Claremont Institute, Founder and Director of the James Wilson Institute, and the Edward N. Ney Professor in American Institutions (Emeritus) at Amherst College. Dr. Arkes is the author of many books on politics, political philosophy and jurisprudence, including Bureaucracy, the Marshall Plan and the National Interest (1972), The Philosopher in the City (1981), First Things (1986), Beyond the Constitution (1990), and The Return of George Sutherland (1994), Natural Rights and the Right to Choose (2002), and Constitutional Illusions and Anchoring Truths: The Touchstone of the Natural Law (2010). His articles have appeared in professional journals, but apart from his writing in more scholarly formats, he has become known to a wider audience through his writings in the Wall Street Journal, the Weekly Standard, and National Review. He has been a contributor also to First Things, a journal that took its name from his book of that title. For eight years, he wrote a column for Crisis magazine under the title of "Lifewatch" and he has carried over that concern as one of the band of friends who formed the new web journal The Catholic Thing. He was the main advocate, and architect, of the bill that became known as the Born-Alive Infants’ Protection Act. The account of his experience, in moving the bill through Congress, is contained as an epilogue or memoir in his book, Natural Rights & the Right to Choose. On August 5, President Bush signed the bill into law with Professor Arkes in attendance. Arkes received a B.A. degree at the University of Illinois and a Ph.D. from the University of Chicago.